The tactics are working. 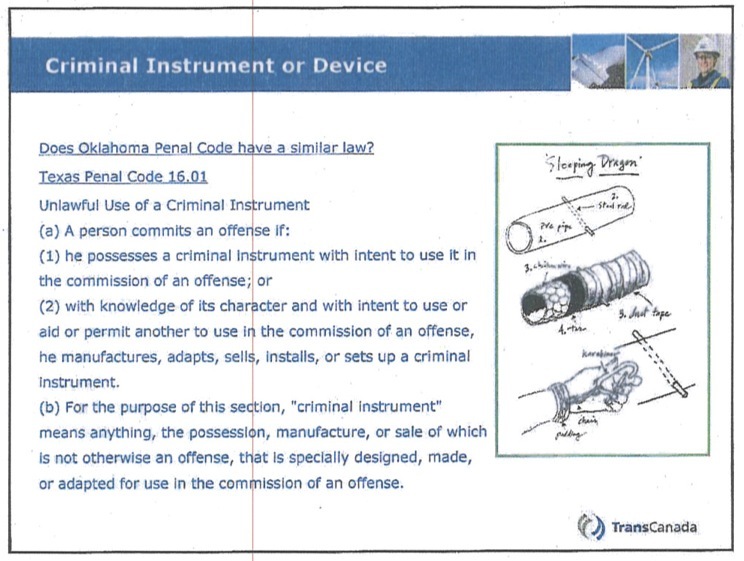 In response, TransCanada is filing lawsuits across the country in hopes of deterring opposition; in Oklahoma, they recently filed a restraining order against protesters. 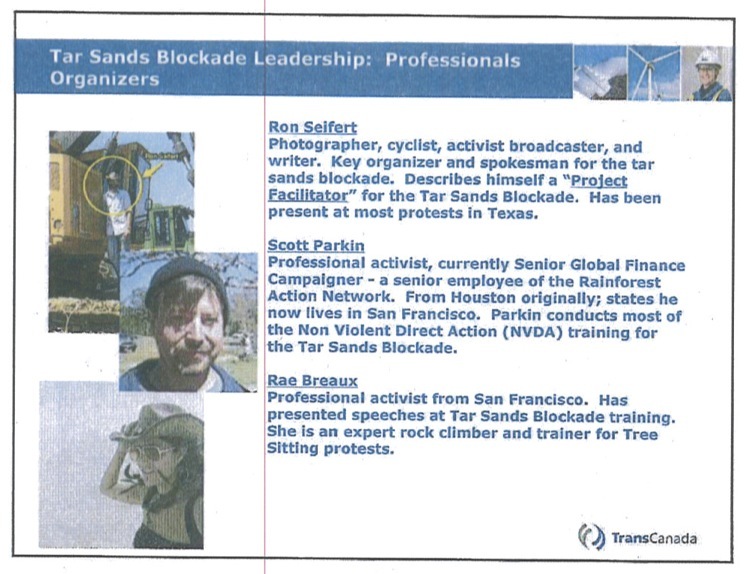 New documents show that TransCanada is also working behind the scenes with local police, providing cops with names and photographs of dozens of activists, warning of non-violent tactics, and urging terrorism prosecutions. A TransCanada PowerPoint presentation was obtained by Bold Nebraska through the Freedom of Information Act. 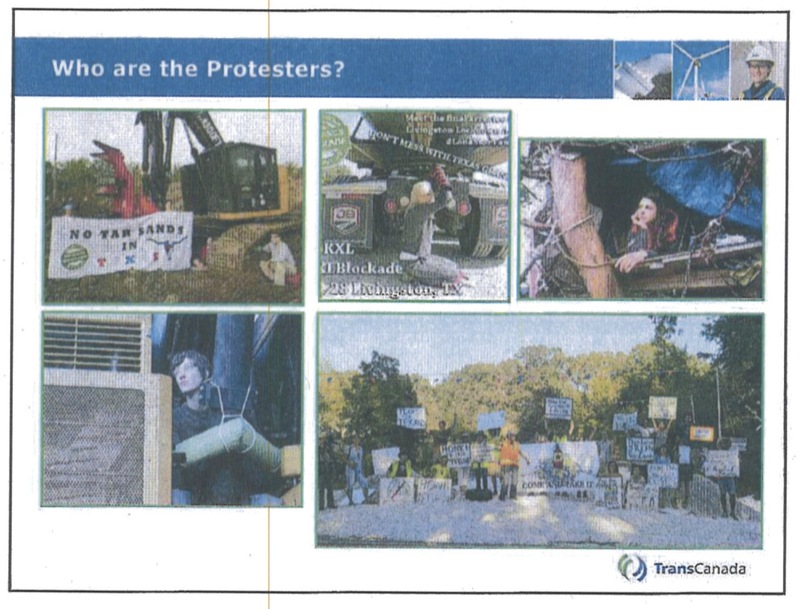 The briefing is dated December 11, 2012, and offers a rare look at how the energy industry giant is trying to silence its opposition. 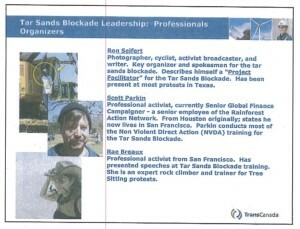 Most of the photos of activists appear to be taken directly from protest websites like Tar Sands Blockade. In other words, activists are not trying to hide their motivations. They are open about who they are, what they are doing, and why they are doing it. What have protesters done that is so troubling to TransCanada that they need to beg law enforcement for assistance? “They may climb and occupy trees,” TransCanada warns. In Texas, there has been “demonstrations / protest activity,” “tree houses,” “banners,” “social media organization,” and again — no physical violence. In Nebraska, where this briefing took place, there has been “protest/demonstrations” and “opposition attendance” at public meetings. At the very worst, landowners have allegedly been heard saying they “longed for the days when you could shoot people on your land.” However, there has not been any property destruction in the state, let alone violence. 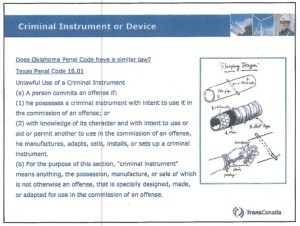 What’s particularly troubling about this presentation is that a corporation is briefing law enforcement about who, when, why, and how they should prosecute. This isn’t empty rhetoric. In Texas, a terrorism investigation entrapped activists for using similar civil disobedience tactics. And as I reported recently for VICE, Oregon considered legislation to criminalize tree sits. TransCanada has been using similar tactics in its home country as well (for a detailed look: “7 Ways Canadian Environmental Groups Are Being Attacked as Terrorists”). In addition to briefing law enforcement, TransCanada is also hiring off-duty cops. In a brazen conflict of interest, local police are being paid extra cash during their off hours by the same corporation that is asking them to arrest protesters while they are on the job. Gulf Coast Project — recent media attention. Keystone XL — media, high profile. Notice the emphasis on media and public exposure? TransCanada is not pleading with law enforcement to crack down on property destruction or violence, because that’s not what this campaign is about. The campaign against the Keystone XL pipeline has resulted in widespread public support, and positive media coverage about people willing to non-violently put their bodies on the line. That’s why TransCanada has also hired a new PR agent: the corporation says “we have been dwarfed by the content the activists have and are posting online with respect to Keystone XL.” And they say they may hire PR giant SKDKnickerbocker.